Does your dog have difficulty being left home alone? Does he bark too much, soil in the house, become destructive or escape from your yard? Do you worry that your dog is distressed or bored when home alone or do you think your dog misbehaves because he’s mad you’ve left him? NOW you can get the help you need! 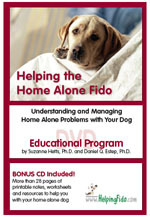 In this innovative DVD program, you’ll discover the REAL reasons for your dog’s home alone behaviors and what YOU can do to help your Fido be good when home alone. The six most common myths about reasons for home alone problems that you might have believed! © 2003-2013 Animal Behavior Associates, Inc.